The first: smart content marketers have learned that just publishing content more often won’t work. Drowning an audience with more and more content they aren’t engaging with doesn’t get you anywhere. It’s time to get more strategic with our content, both in terms of how often we publish, what we publish, and how we get results. 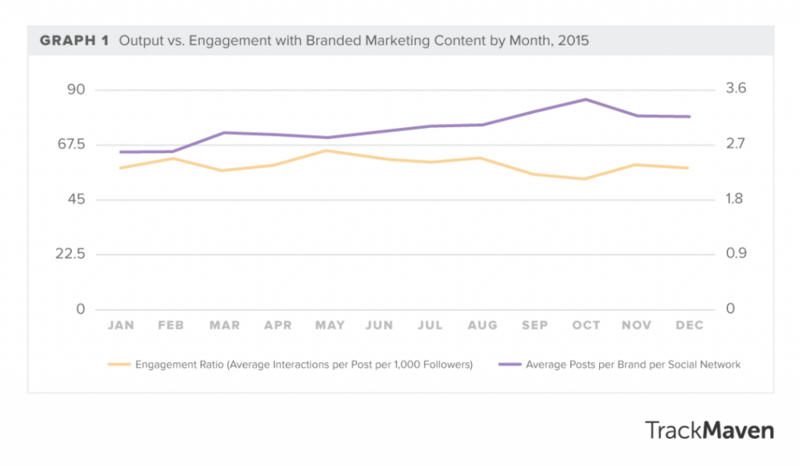 The second: marketers are fixated on engagement simply because engagement rates are falling. There’s anecdotal evidence of this galore, but a study from TrackMaven last year clinched it – engagement rates are officially in decline. It also appears engagement rates are in decline specifically because there is so much content being published. You’ve also certainly heard of this before, probably described as “content shock”. Let’s face it: Getting people to engage with your content is no small task. There are a lot of different factors that have to line up. You’ve got to pick the right topics, for starters. And it helps if you’re in a niche that isn’t drowning in content, too. Then there’s the fine art of picking the best social media platforms for your audience, and choosing content formats they prefer. That’s all important stuff, but for this post, we’d like to focus on increasing engagement for plain old text-based content: blog posts, eBooks, and the like. Text-based content is at a bit of a disadvantage compared to videos, images and interactive content. It’s not quite as alluring as moving pictures and new technologies. It can help to have fewer words on the page, as the chart below shows. But 200-word blog posts don’t work very well. 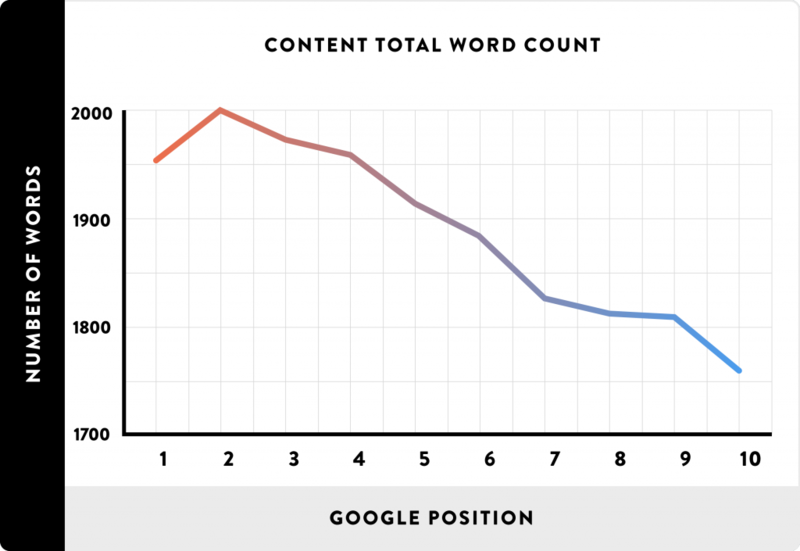 In fact, Google slightly penalizes pages with less than 300 words. So what to do? How do you get readers to stick with your content long enough to finish a full-length blog post, much less the super-long posts so many SEO studies (like Brian Dean’s 2016 Search Engine Ranking Factors Study) show do best in the search results? Well, there are a few tricks. Not really “tricks” per say, but techniques for making text-based content more readable for both people and search engines. These tricks are actually really easy, and may help you write more easily, too. Long blocks of text drive readers away. That’s the gist of why subheaders work. It’s based on a psychological principle of “chunking”, which is to break up information into more manageable pieces. Subheaders are also excellent for SEO. That’s because they’re typically set in <H2> or <H3> tags, and search engines are set to recognize those tags as holding subheaders. So try to get a few keywords into your subheaders, but don’t go crazy: Over-optimizing pages is not a good idea. Finally, subheaders work well for readers who scan. They show what each section is about, so readers can zoom in on the information they care about the most. This takes chunking one step further. While having sections in your posts breaks up the “wall of text”, short paragraphs break them up even further. Short paragraphs are especially important for mobile readers. Because their screens are so much smaller, lines of text get wrapped more often. So even a paragraph that looks short on a laptop can become long once it’s read on a mobile phone. The solution? Many expert sources (like Copyblogger) recommend paragraphs no longer than three sentences. That mirrors an old-school copywriting rule of keeping paragraphs to five lines or less, or the old grammar school advice of one idea per paragraph. Occasionally, even adding a one-paragraph sentence can add some punch. These are chunking taken to the extreme. If subheaders were for sections, and paragraphs are for ideas, bullet points can be honed down to single words. Bullet points are also ideal for lists. So any time you’ve got a sentence with a list (look for lots of commas) consider converting it into a list of bullet points. Just don’t make them go on too long – one of the rules of chunking is not to have the chunks be more than 5-7 items. That’s about the maximum number of things the human brain can comfortably grasp. Bullet points also work to counteract that “wall of text” problem. If you’ve got a spot in your copy that needs some air, see if a list of bullet points would fit. As if that wasn’t all enough, it appears that bullet points (aka “ordered” or “unordered lists”) help with search engine optimization, too. Searchmetrics 2015 ranking signals study said 47% of the average top ten listings contain unordered lists. Given all the calls to break text down so far, you’re probably not surprised we’re going to talk about breaking sentences down, too. This shifts us into another principle of readable, engaging copy: Make it easy to read. One way to do that is simplify your sentences. There are plenty of tools to help you do this. The Hemingway Editor is one. It’s free, user-friendly, and great for showing you how to make your writing clearer. 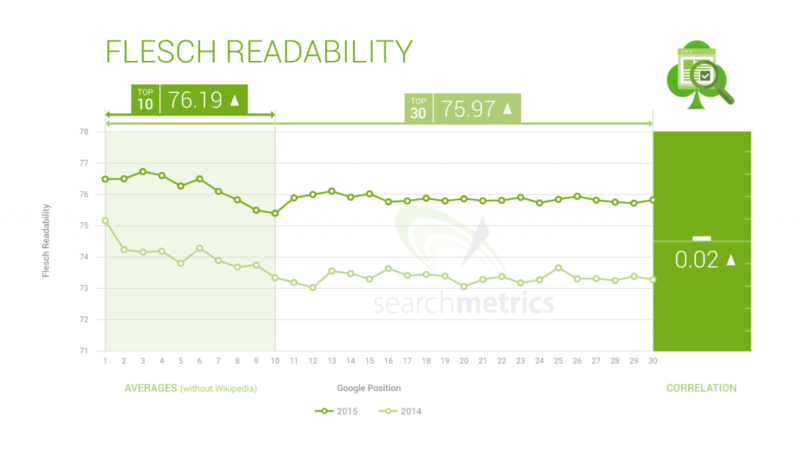 Use it to improve your content’s search engine optimization, too: several recent studies have revealed that readability is probably a ranking signal. You’ve heard writing coaches rage about “jargon,” right? And I’m sure you’ve read the articles about clichés and worn-out metaphors. Well, this tip speaks to all of that. It basically just means to write as clearly as possible. Part of that means cleaning up your sentences, but another part is to simply use words and terms people will understand. Remember: Most American readers aren’t comfortable reading above a 7th grade reading level. Using bold: Bolded words or terms help readers scan. They pop up a bit from the rest of the text, and so that gives you another tool for attracting or directing readers’ attention. Using italics: Italics attract attention, too, but I wouldn’t recommend using them very often. However, once in awhile, here and there, it is nice to use them for extra emphasis. Just don’t go too far – your good writing skills and word choices should be responsible for most of the emphasis. Those one-line paragraphs we mentioned earlier are a good tool for emphasis, too. These are another way to break up boring text. But they’re also good for conveying authority. You’re borrowing from someone else’s authority, of course, but quoting people is a great way to back up an opinion. It can also be good for making friends with influencers, should that be your goal. We’re starting to shift into typography issues with this one. But this applies to SEO and advertising, too. Some companies publish content based on the advertising model. Because they make their money from ads placed around their content, they can get lured into squeezing ads into every available space. Don’t cram your pages with ads, or with content. Add some white space for your readers’ eye to rest. There’s an old typography rule for line length: Keep it between 50 and 75 characters. Any longer and people will start to have issues reading (they’ll have to move their eyes back and forth a bit more than is comfortable). Any shorter and they’ll be jumping from line to line more often than is comfortable. This one’s incredibly important for mobile users. Text that’s too small to read on a phone will drive them away. So what’s the minimum size? About a 14-point type size, though some experts recommend 16 points. I had thought that font size wasn’t going to be a ranking signal, but it ends up I was wrong. According to the 2015 Searchmetrics Search Ranking Factors study, font size is indeed a ranking signal, though not a major one. It appears the search engines prefer 14-point type. I’ve listed these last, but they’re definitely not least. Images serve a number of purposes, even if they’re just decorative. A pretty picture attracts the readers’ eyes – it invites them in as much as any title. This might not make perfectly logical sense, but we’re not perfectly logical creatures. And boy, do we love pretty pictures. It ends up that search engines like images, too. Both Brian Dean’s Search Engine Ranking Factors Study and Searchmetrics’ study say images help pages rank. Dean says pages need just one image to get the boost, while Searchmetrics says the top 10 listings have, on average, ten images apiece. Of course, visual content is also very popular right now, and for good reason: It can telegraph it’s meaning. Infographics can often explain a situation or a fact far better than words will ever do. This isn’t a bad thing for us writers – use images where they work. Adding a few small, simple infographics to a blog post is a fantastic way to increase shares, and to convey complex ideas to readers. If there was any doubt about how meshed content marketing and search engine optimization have become, you only have to look to how content formatting affects SEO rankings. As Google and Bing get more and more focused on user behavior, and content marketers get more and more focused on engagement (which is just another term for user behavior), it seems like the two disciplines are overlapping more and more. If you want to find out how to manage, monitor and improve your content marketing results, feel free to sign up for a demo of the new Scoop.it Content Director! And if you’d like to get great tips to improve your SEO rankings, you should read this eBook! 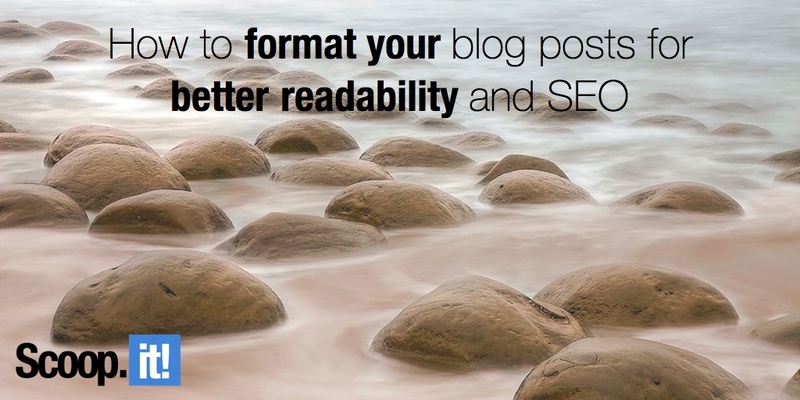 5 Comments on "How to format your blog posts for better readability and SEO: 11 effective tips to improve engagement"
Ingenious and Implementable! Due to too much information and tools available on the web, it’s become tricky sometimes as to which to read/follow when it comes to SEO. Thank you @pamellaneely:disqus for this article! Nice tips and easy to understand. Keep sharing awesome content. I’m bookmarking this too, these are great articles Pam!